On November, 9, 2015, we opened the new CHCBH Consolidated Center. Now you can receive Pediatric, Family Practice, and Dental services all at the same location! Lab, x-ray and pharmacy are also available! We are proud to provide high quality medical, dental, and mental healthcare to all people, young or old, insured or uninsured, and regardless of one’s financial status. 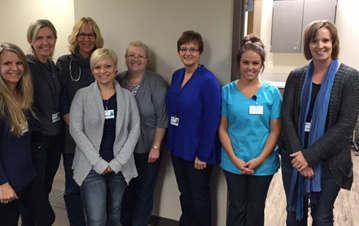 South Dakota women have help to cover the cost of breast and cervical cancer screenings through the All Women Count! Program. Mammograms, pap smears, and related exams are available at no cost to eligible women. To be eligible for a pap, women must be 30-64 years of age. Women 40-64 years of age may also qualify for a mammogram. Income guidelines must be met. Most insurances accepted. Call 605-721-8939 for more information. Let our Family Planning Program help you meet your future dreams and goals. We deliver comprehensive and medically accurate reproductive and sexual health information that empowers women, men, teens, and families to make informed choices and lead healthy lives. Find out more information on Family Planning. Self-pay patients will be charged for services based on their income and family size. Through a staff of Medical Doctors, Physician Assistants, Certified Nurse Practitioners, Dentists, and support staff, Community Health Center of the Black Hills gives unconditional primary care. Our staff of medical professionals gives patients the highest quality medical care and programs for overall healthy living. United Way of the Black Hills organizes and implements an annual fundraising campaign to help support the budgets of 52 local nonprofit agencies. Currently, community-wide campaigns are conducted in Rapid City, Sturgis, Lead, Deadwood, Spearfish, Belle Fourche, Keystone, Hill City, Custer, Hot Springs and Edgemont.